Capital Captions provide video transcription services within a number of industries and sectors. We work with qualified, experienced linguists and transcriptionists with a huge variety of specialisms and in over fifty languages. Alongside transcription, we also offer subtitling, closed captioning and translation, but here, we’ll focus on some of the subject areas and specialisms in which we provide video transcription services. We work with a variety of different formats within our medical transcription services. Our fully qualified, experienced medical secretaries are able to assist with transcribing GP letters, medical reports, patient summaries, procedural notes and consultation reports. Some of our areas of specialism include oncology, neurology, general surgery, orthopaedics, urology, gynaecology, cardiology, ophthalmology and more. Working with highly qualified, experienced transcriptionists, we provide typing services within the financial sector. This includes investment meeting transcription, interview transcription, sales call transcription, copy typing, data entry and PowerPoint presentation work. For students on a budget, we offer discount transcription services of up to 10% off. Services include student research transcription, thesis transcription, focus group transcription, dictation, copy typing and Word, Excel and PowerPoint formatting. In addition to transcription for students, we also offer academic and educational transcription services. This includes transcribing lectures, copy typing course notes and study material and video transcription and subtitling of e-learning courses. Closed Captioning, subtitling and video transcription is our specialty. 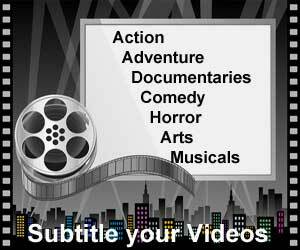 Our transcriptionists and subtitlers are highly experienced in working with documentaries, news, movies, sports and children’s television shows. In addition to transcribing and captioning broadcast video content, we also provide time coded transcription logging of rushes in order to assist with pre-production processes. If you’re still unsure of what video transcription services you require, take a look at our transcription services sectors to see which one is right for you. Once you have the right one, contact us today for your free quote.